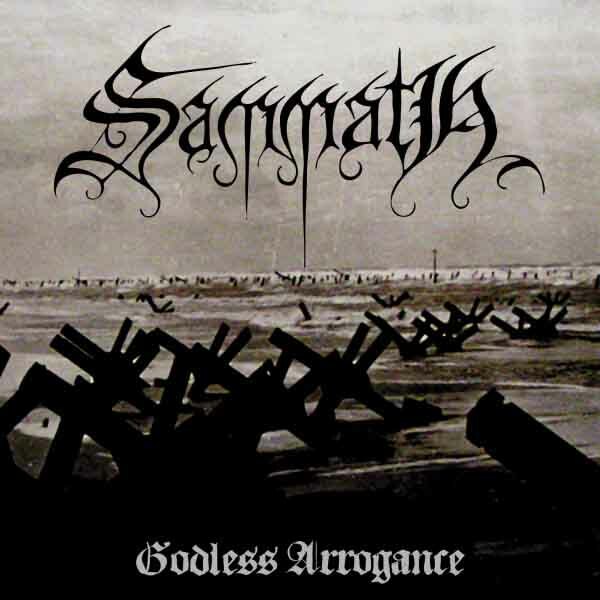 Sammath combines the dark melodic understructure of black metal with the type of charging full-ahead death metal that Fallen Christ or Angelcorpse pioneered (which might descend from Morbid Angel’s “Thy Kingdom Come”). At this speed, the riff-salad approach of more traditional death metal would become a muddle, so the band focuses on a few ripping riffs per song and uses song structure deviations to incorporate entirely different riffs to create dialogue with the main verse-chorus pair and the Slayer-style introduction/transition riffs that accompany it. Remarkably, Sammath has been consistent in this approach but have not found a voice for it until now. 1999’s Strijd showed an archly elegant melodic sense and underlying violence, but switched between the two much like later Entombed varied between pounding d-beat ambient riffs and architectures derived from John Carpenter soundtracks that showcased a spatial element to the music. During the early 2000s, two transitional albums Verwoesting/Devastation and Dodengang showed the band refining its rhythmic attack. Building on that past, Sammath went for guitar technicality and a more death metal approach to riffs on Triumph in Hatred but ended up losing the tendency to create an expansive spatial feel with complementary but radically different melodies in the death metal style, which uses riff to define context and then alters context for a type of continually evolving surprise ending. Godless Arrogance features nearly constant high-intensity rhythmic riffing and finally has a production to match which emphasizes internal harmony but projects vocals and guitars to the forefront, creating an enveloping wall of sound. Drumming is violent martial battery without the happy kickbeat tendencies of overly rock-trained drummer; percussion here is more like punk, hard-driving intensity to channel the guitars, which alternate between abrupt chromatic confrontation in the Demoncy style to gentle unfolding melodies much like were found on Strijd. Bass folds into the guitar, and vocals are the high-volume bluster that reduces distorted vocals to a sound like a whisper spoken close to a microphone in high wind. The result is incessant and unrelenting but also has an inner life of melody that gives it depth and allows it to manipulate riff context like a death metal band while evoking ambient atmosphere in the best tradition of black metal. “Godless Arrogance” will be released February 3, 2014 on Hammerheart Records. This is the album that I’ve been waiting for all year. This one’s going to be the best album of 2014, I’ll tell ya that right now!! Sadly to me, no metal album has interested me this year so far. S.R. Prozak’s suggestions are of great use but, so far I’m cool just going back through my personal collection and digging up forgotten B – albums. Even a C – album from 1994 grabs my attention in a way that no newer bands can. Maybe I’m a hopeless nostalgic or maybe there is something in the past that I know exists only there, in the past. I’m with you 100%. This albums mp3 teasers and YouTube videos show a warm, balanced attack that has heart and conviction that so many bands lack these days. The song construction on display is as solid as ever, and the production is superb! As you said, I have been waiting for months for this album. I take every recommendation seriously here and on last.fm (the groups I join) but 90% fail to interest more than for a few listens. So I listen to the old stuff waiting for Feb 3rd. I was never convinced by Strijd. Only its elements work, not the full picture, at least not for me. This album on the other hand, seems like it has the attack down. Really looking forward to it.